If you don’t change what you’re doing now, you will only receive what you have now! JUST START! Are you willing to do what’s needed today so you can have better health tomorrow? JUST START! Want a change? Make a change! JUST START! Sometimes we need a change in our lives, but it seems overwhelming to even start. That’s why we have simplified our steps to health, so ANYONE can do it and begin NOW! Just start! WATER, WATER, WATER! Drink water! Our body is made up of water. Water flushes our system of waste and toxins. Everybody should drink six to ten 10-ounce glasses of water every day. To someone who hasn’t drank that much water it may seem impossible to drink that much! But, if you just start today, you can build up to that much water quickly. Begin by taking your vitamins in the morning with a full glass of water. Do that again at lunch and again at dinner, and you will already be on your way. INCREASE MOVEMENT! Move that body! Exercise will greatly improve your health. It will also improve your mood, your memory, your sleep patterns and many other areas of your life. How do you do it? Just start! Walk to the store; walk to the mailbox; park at the end of the parking lot and walk the rest of the way. Buy an exercise video and follow it for 20 minutes each morning. Twenty minutes is not a lot to ask of you for better health! Sign up for a dance class; join a gym; get some friends together for moral support and walk together – combining fellowship with walking! 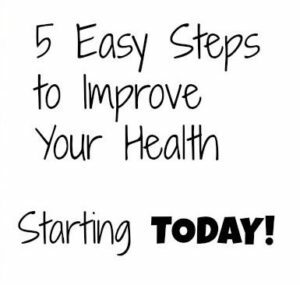 Whatever you need to do, just start and you will feel better quickly and be on your way to better health! SUPPLEMENT YOUR DIET! Add vitamins, minerals and herbs! The American Medical Association has now stated what we have known for years: You cannot get all the nutrition your body needs from just diet alone, especially with the typical American diet. You must supplement your diet with vitamins, minerals and herbs. Your body needs to be running at an optimum in order to reach ideal health, and that optimum will be reached with proper supplementation. You should look for high quality products from a reputable company. Contact someone who is an expert in this area in order to tailor the right supplements to your individual body and lifestyle. The nutrients should become a part of your life, for the rest of your life. They are no longer a luxury but a necessity. Just start on a supplemental regimen and you will see vitality come into your life immediately! R & R! Rest your body regularly! There is an epidemic of heart disease, obesity, nervous disorders and high blood pressure in America. It has been found that these conditions, and more, are directly related to lack of rest and sleep! One of the Ten Commandments is to Honor the Sabbath. The Divine blueprint for human life is to rest and restore the body on a regular basis. God valued rest so much that on the seventh day even He rested! Especially in this hectic world we live in, we need to completely rest our bodies at least once a week, and regular sleep is important on a daily basis. Start by being consistent in your retiring and waking hours. Go to bed at the same time every day, and rise at the same time. One day a week, retreat from the world by turning off your cell phone, telephones, internet and fax machine. Read a book, build a fire and watch a movie, play card or board games with your kids, go for a walk, take a hike, or even take a nap! The world will still be there when you return to it the next day! Just start this time of rest and relaxation one day a week and your body will thank you for it! PRAY! You cannot do it without His help! Ask the Lord to help you! He created you to be in perfect health and to live a long life. “With long life will I satisfy him.” Psalm 91:16 Who wants to live a long life if they don’t feel well enough to enjoy it? Make a habit of spending quiet personal time alone with God each day. Talk to Him. Pour your heart out to Him. Then listen! He will tell you what to do for your health. He will help you, as you honor Him. He loves you and wants you healthy and whole! Just start! Start each day with the Lord, asking Him to help you gain optimal health.